To ensure a rapid path to implementation, IICC has established three active partnerships whereby members of the IICC Technical Team are assigned to specific partner organizations, becoming members of relevant work groups. Health Level Seven International (HL7) is the standards development organization (SDO) for IICC. Integrating the Healthcare Enterprise (IHE) is the integration profile developer for the IICC initiative. 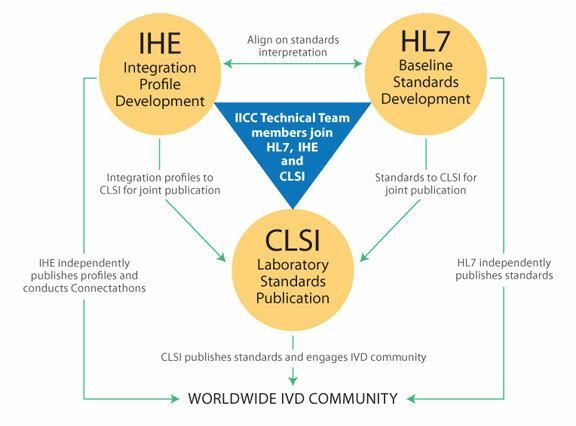 Clinical and Laboratory Standards Institute (CLSI) is the laboratory standards publisher for the IICC initiative. A new CLSI document development subcommittee, which will include IICC Technical Team members, will be responsible for publishing the standard.